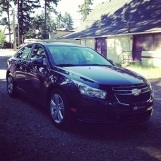 My Experience with the New 2014 Chevrolet Cruze Turbo Diesel! We recently received a 2014 Chevrolet Cruze Diesel and when the opportunity arose to drive it I thought, “Well this will be different!”. I had never driven a diesel vehicle before and generally thought that diesel engines were mostly reserved for big trucks and Volkswagens. Needless to say, this was new to me. When I first opened the door and got into the Cruze I was pleased with the interior. The Cruze Diesel comes standard with an automatic transmission, MyLink audio system, and heated leather seating. As options you can add a sunroof and navigation. It is well equipped with power driver’s seat, power group, leather wrapped steering wheel with audio controls, and has a 2.0L turbo diesel engine. that puts out 148 horsepower and 258 ft. lb. of torque. When I started the Cruze I was further impressed by the fact that I could hardly hear the diesel engine.